Nebraska gets its name from an Indian word meaning "flat water" after the Platte River that flows through the state. 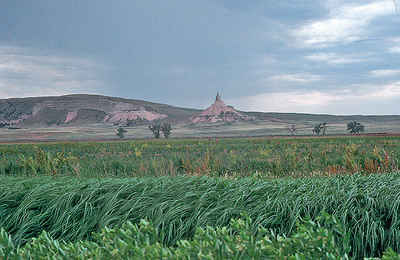 The Nebraska Territory was formed in 1854 at the same time as the Kansas Territory. Nebraska was admitted into the Union on March 1, 1867 as the 37th state. President Andrew Johnson vetoed the Nebraska statehood bill of 1866, but Congress overrode his veto, and Nebraska became a state. Its nickname, "Cornhusker State," refers to the way that corn (a leading product of the state) was commonly harvested, "husking" it by hand, before the invention of husking machinery. Another nickname, the "Beef State," refers to one of Nebraska's main industries, cattle. Omaha has been a major meatpacking center since the 1880s. Although Omaha was the territorial capital, Lincoln, named in honor of the 16th president, is the state capital. The state flower of Nebraska is the goldenrod.